Alpine Meadows rests in the heart of the BC wilderness, uniquely suited to making the most of this amazing natural playground. Convenient to six breathtaking Provincial Parks, including the awesome Wells Gray Park at our doorstep, the possibilities for exploration and excitement here are endless. Within Alpine Meadows Resort, opportunities abound for guests looking to escape into the tranquility of the environment, as well as those with a more energetic bent. Boating on Hallamore Lake, hiking one of the many beautiful trails, relaxing in our inviting hot tub, or even just reconnecting with family and friends, this is the perfect place to make your vacation exactly what you want it to be. There is so much to explore in the greater North Thompson region! 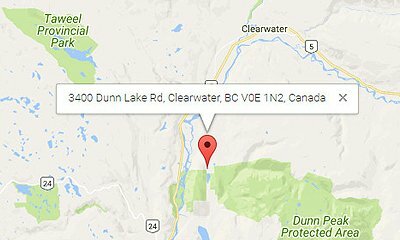 With 50 well-stocked lakes within a one-hour’s drive of Clearwater, this part of beautiful British Columbia is a fisherman’s dream. Hallamore Lake, on the grounds of Alpine Meadows Resort, has an abundance of rainbow trout. Catch your dinner right here in our waters! Fishing licenses and boat rentals are available. Farther afield, the Clearwater River is an excellent place to try your hand at fly fishing, or choose to spend a quiet day casting your reel on Dutch or Dunn Lakes. The Mahood, Mad, Raft, and North Thompson Rivers each offer choice spots for anglers, as well. Inside Wells Gray Park, and around this region, remote and plentiful waters full of salmon and trout are often found at the end of a beautiful hike (a worthwhile reward!). Sign up for a guided excursion, or wade in on your own –you’re sure to find the perfect honey hole. Little Fort Fly & Tackle – Little Fort boasts some of the best fly fishing in North America, with hundreds of quality lakes and several pristine rivers in the area. Little Fort Fly & Tackle provides guided trips. A full-day excursion includes transportation, a packed lunch, and tackle. Call 250.677.4366, or email info@littlefort.com. Silent Sport Guided Fly Fishing – Refine your fishing skills or visit the hottest spots for rainbow trout, salmon, or Dolly Varden char, on a guided fishing excursion with Silent Sport Guided Fly Fishing. Call 250.674.2557. Clearwater Trout Hatchery – Fishing enthusiasts should be sure to visit the Clearwater Trout Hatchery. Open daily for visitors throughout the summer, the hatchery stocks over 330 lakes, and releases approximately 300 million fish per year. It’s a great place to visit for families and fish lovers, alike! 40 Old North Thompson Highway East, 250.674.2580. There’s a reason this area is called Clearwater! The crystal glacial lakes and shimmering rivers that surround us invite visitors to jump right in. Whether you’re a seasoned swimmer looking for exercise, or just keen to spend a family day playing on the shore, you will find exactly what you’re looking for in the waters around Alpine Meadows. Our own Hallamore Lake is placid and inviting, a wonderful place to relax and play. Locals are partial to the nearby recreational beach and warm water at Dutch Lake. Those with stronger constitutions brave the exhilarating showers of the famous Wells Gray Provincial Park waterfalls, and hikers always feel refreshed after a quick dip in one of the many rivers or hidden pools throughout the region. For some, a soak in the Resort’s beautiful hot tub is the perfect end to a day of North Thompson adventure. Please note, due to glacial run-off, area waters may be cold! No lifeguards are on duty, so swimming is always at your own risk. Paddlers, rejoice! The Clearwater BC region’s waters are perfect for anyone keen to explore in a kayak or canoe. Alpine Meadows Resort offers canoes, kayaks, and rowboats to enjoy on beautiful Hallamore Lake. Nearby Wells Gray Park is the perfect place to discover BC’s celebrated, pristine waterways. Relax in the serenity of Clearwater and Azure Lakes, which are connected by a short portage trail, or take a turn around stunning Murtle Lake, the largest non-motorized lake in North America. Other popular paddling spots include the Clearwater River and Elmar, Mahood, and Hobson Lakes. Local paddling outfitters can rent all necessary equipment, or sign up for a guided tour. Clearwater Lake Tours — Day long rentals, and customizable guided trips make these adventures perfect for every paddler. Wells Gray Adventures — Swim and paddle across some of the most awe-inspiring waters in BC. Indulge in two-wheeled adventures in the varied and exciting terrain throughout the Resort and the nearby provincial parks. Well-marked mountain biking trails, like Whitehorse Bluffs and Gates Creek, can be found close to Clearwater. Gates Creek is a multi-use trail (ATV, horseback riding, biking) that runs above the Clearwater River Road. The lower section has a moderate grade with some short steep pitches, and can be ridden in either direction. Stillwater Trail, located at the entrance to Wells Gray Park, joins a loop with other popular and challenging trails: McLeod, Murtle, and Blackwater. Single Track Adventures – Enjoy 2.5 hour, half-day, and full-day mountain bike adventures in Clearwater and Wells Gray Park. Get a bird’s-eye view of this beautiful part of the world on an exhilarating tandem paragliding flight! The North Thompson is spectacular from every angle, but the vistas from the air will make your heart soar. Flying with a certified paragliding instructor and tandem pilot, you’ll experience this beautiful region in a manner that few people ever get to do. XSky Paragliding – Private and safe tandem flights (air time is roughly 20 minutes) are the key parts of each 2-hour excursion. Photos and videos are included. Get your adrenaline flowing with a Grade V rapid, or float peacefully downstream –local outfitters have the perfect river rafting adventure for everyone. Have the time of your life riding some of the most exciting rapids in British Columbia. Interior Whitewater Expeditions – Offering whitewater rafting and lower-key float trips. Most adventures take place on the beautiful Clearwater River. Choose from a variety of rafting packages, from heart-pounding thrills through Sabertooth Canyon to an easy, family-friendly float through the breathtaking scenery of Wells Gray Park. With a focus on safety, this is a great choice for your rafting experience. A great way to enjoy the scenic hills and beauty of Clearwater and Wells Gray is while on a horseback riding adventure. When you are riding a horse through the scenic and natural vistas of the area, you can really discover the true meaning of outdoor natural adventure. Vavenby Trail Rides – Located at The Shook Ranch in nearby Vavenby. Enjoy a guided horseback ride on a working cattle ranch. Children, novices, and experienced riders are all welcome. Rides range from one hour to full-day adventures. For a unique ranch experience, ask about a roundup ride, where you can help move cattle to fresh pastures on the ranch! Call 250.676.9598 to book. More than 250 species of birds have been recorded around the Wells Gray area. Woodpeckers, grouse, nuthatches, chickadees, and hummingbirds make their homes, here. Birdwatchers flock to the region to catch a glimpse of the shy black-crowned night-heron and the northern mockingbird. Migration season also brings owls, ducks, and sandpipers to the area. Pack your binoculars and observe our feathered friends in this incredible woodland wilderness. For a fun birdwatching challenge, print out the Wells Gray birdwatching checklist, and see how many you can spot. Occasionally, guests at Alpine Meadows are treated to a visit by neighbouring black bears. Please be aware that these are wild creatures! Never feed the bears, and always make sure to respect their space. We recommend bringing a bear bell along if you are hiking. For a thrilling-yet-safe bear encounter, we recommend a guided bear watching excursion through “Grizzly Bear Valley”, in nearby Blue River Black Spruce Provincial Park. These animals are majestic and awe-inspiring –a true Canadian treasure. A guided tour will allow you to observe them in their natural habitat, while giving them a wide berth, for their protection as well as yours. It is sure to be a memorable experience. River Safari – This one-hour guided tour (by boat or by Jeep) is appropriate for all ages and accessibility needs. The amazing ride takes visitors through the heart of bear country and the breathtaking inland rainforest. Grizzly and black bear sightings are the highlights of the trip, but other iconic Canadian animals make their homes here, too. Be captivated by moose, eagles, and osprey on this once-in-a-lifetime adventure! Based in Blue River, call 1.877.494.5322. One of the most awe-inspiring ways to explore Wells Gray Park and the Clearwater region is on foot. No matter what amount of adventure you seek, this region boasts some of the best hiking trails in all of British Columbia. Walking and hiking routes range from easy to challenging, and cover more than 200 km throughout the park. The easily-accessed Corridor trails offer a variety shorter hikes, including treks to 10 of the park’s spectacular waterfalls. Intrepid hikers of all ability levels will find plenty of engaging routes in Wells Gray, from gentle, forested loops to exhilarating alpine climbs up Trophy Mountain. Please note, some trails may not be maintained, and are best suited to experienced hikers. Free trail maps are available online or from the Clearwater Visitor Centre. Park rangers offer free guided tours throughout the summer season (inquire at the Visitor Centre). More in-depth tours to some amazing, secret spots are available through private companies. Discover Wells Gray — Interpretive guides and focused hikes appeal to all varieties of nature enthusiasts. Wells Gray Adventures — Full-service, guided day trips led by naturalists make you feel truly connected to this beautiful region. Clearwater Lake Tours — Customizable trips make hiking a personalized experience.